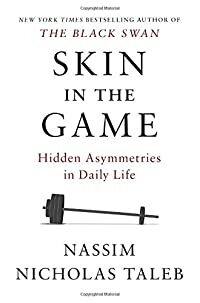 Nassim Nicholas Taleb's Book - Skin in the Game: Hidden Asymmetries in Daily Life..
• Cover Type: Hardcover.. 304pages.. ..According to Taleb, "The symmetry of skin in the game is a simple rule that's necessary for fairness and justice, and the ultimate BS-buster.." and "Never trust anyone who doesn't have skin in the game. Without it, fools and crooks will benefit, and their mistakes will never come back to haunt them.."